Well, guess what? 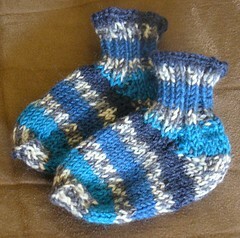 I really did go back and make the second sock. See? I sewed up all the little holes (you can sort of tell) and they look so cute! 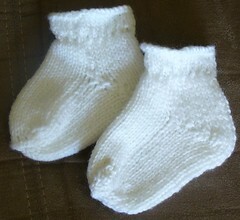 I’m a bit concerned that they might be too big – how big are a baby’s feet, anyway? But as everyone (including myself) keeps reminding me, babies grow. Oh, here’s the pattern I used, by the way. Anyway, I’m getting the hang of the size 2s (my smallest needles) and I think I need to buy some smaller ones. Sadly, I haven’t been able to find any sock-type needles around here yet. Anyway, I did a much, much better job of the short-row wraps on the stripey socks, thus eliminating almost all of the holes. On the second stripe sock, I tried a wrap when I went back to all three needles, and guess what?!? No holes at all! Yay! I still think many knitters are way too obsessed with socks, but their position is beginning to make an eerie amount of socks. I mean, sense. ← Working hard, or hardly working?